Settle Weir & Fish Pass after heavy rain! November has been an excellent month for generating hydro-electricity - the best November on record since we started in 2010. After a slow start, we finished the month with having generated a whopping 17768kWh! During the month, we also achieved our highest ever instantaneous output of 44kW and our highest ever daily output of 899kWh. 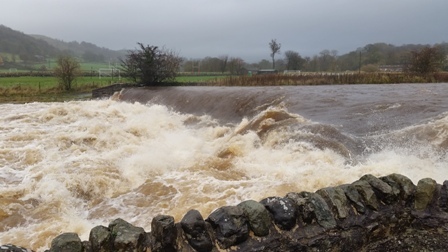 We love the heavy rain at Settle Hydro but it does create its challenges! 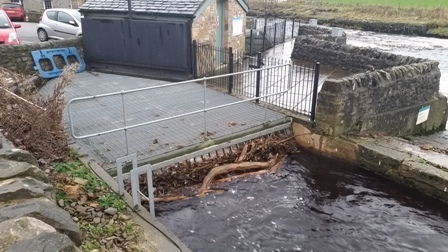 As can be seen in the above photograph, the high river level brings down debris (leaves, twigs, branches, plastic bags and the occasional dead sheep!) which clogs up the hydro's inlet screen and reduces the output. The screen has to be cleared at least once a day whilst the hydro is operating. The twice-daily screen clearing is organised on a flexible rota basis so the more team members we have then the fewer times each individual is required.